At the center of every shopping experience is the payment process. The way that brands connect their products and services to their customers, and in turn receive their payments, is the foundation upon which shopping is built. Digital payments, both online and in-store, are transforming that foundation. 80% of Americans are now shopping through online channels on at least a monthly basis, and digital payments have become a primary stream of revenue for brands across all channels1. While offering digital payment options has the potential to simplify life for customers and increase conversion rates, they are creating an additional layer of complexity that is challenging to keep up with. Between the expanding number of digital payment technologies, the increasing number of devices payments can be completed on, and the continuous blurring of digital and physical buying experiences, it is critical to ensure payments will be successful for every person on every device and in every location. 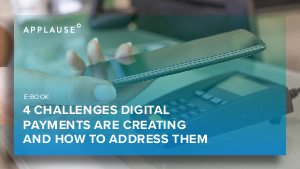 Here is a breakdown of 4 key challenges that digital payments are creating for your brand, and how to address them.